A comprehensive education includes opportunities to explore and discover the fine arts. 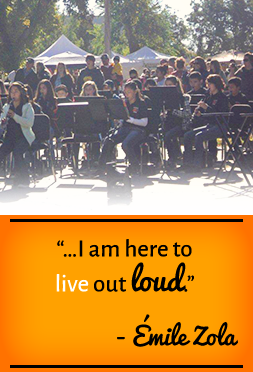 Artesia Intermediate School offers students a variety of choices to open their minds to the beauty of the arts. We hold students enrolled in our fine arts programs to a high standard of behavior; we believe these students are a wonderful example of discipline and commitment. Designed to enhance vocal and musical talent, the Artesia Intermediate choir program is comprised of over 200 students in two advanced choirs and three 6th grade choirs. We prepare for and sing in three concerts a year: the fall concert, the Christmas concert, and the Zia Zing. The advanced choirs also compete in a competition in Portales at ENMU where they tour the campus and attend a musical performance by the ENMU students. We offer a beginning and advanced band program. Beginning band is available for 6th grade students and for 7th grade students taking their first year of band. In this course, we introduce students to instrumental music and concert performance. We do not require students to have any prior knowledge or experience playing an instrument. The Advanced Band course is open to second year band students. We perform a variety of concerts and continue to build upon existing musical skills. We require advanced band students to be academically eligible at the end of their 6th grade year and throughout their 7th grade year to participate in activities and concerts (2.0 GPA and no more than one F). We require parents to provide their child with an instrument and a uniform. Parents of beginning band students should wait until after the first two weeks of school in the fall before purchasing or renting an instrument. Our directors will evaluate each student and recommend an instrument best suited for his or her interests, personality, and abilities. The Beginning Art course incorporates the principles and elements of design into a variety of art media projects and introduces art history and master artists. We will collect a $10.00 fee for all art supplies. Beginning Drawing and Visual Art is available to all 7th grade students. In addition to basic drawing, we embark on a study of the principles and elements of art by learning about art history and master artists and by creating a variety of art media projects. There is a $15.00 fee for all needed art supplies.